The TESS mission provides the community with an opportunity to make ground-breaking discoveries in the field of exoplanets, astrophysics and planetary science. A summary of observing technical details that proposers should be aware of can be found here. A description of the overall mission can be found in Ricker et al. 2015. Brief descriptions of the mission operations, including the TESS orbit, field-of-view, time-sampling, and observing strategy, can be found in the Operations page. Details on all aspects of the mission, developed for GI proposers, are in the TESS Observatory Guide. This website as well as the TESS Instrument Handbook and Data Release Notes should be consulted for the latest information regarding observing with TESS. The figure below shows the 1-hour Combined Differential Photometric Precision (CDPP) from TESS Sector 1. 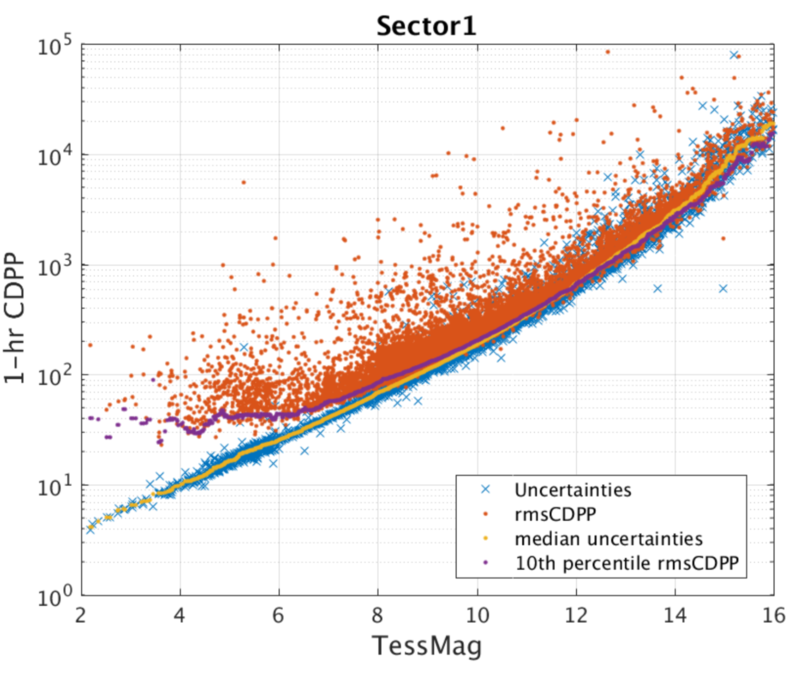 The red points are the RMS CDPP measurements for the 15,889 light curves from Sector 1 plotted as a function of TESS magnitude. The blue x's are the uncertainties, scaled to a 1-hour timescale. The purple curve is a moving 10th percentile of the RMS CDPP measurements, and the gold curve is a moving median of the 1-hour uncertainties. The photometric uncertainties are dominated by pointing jitter, but the best light curves are well below the mission requirements of (1) a systematic error floor at 60 ppm and (2) an achieved CDPP at 10th magnitude of 230 ppm, which is sufficient to detect super-Earths around bright stars. For fainter stars around Tmag = 16, the photometric precision drops to about 1%, which is still sufficient for many astrophysical studies such as supernovae and stellar variability. Saturation is anticipated in the central pixel at I_C = 7.5. This, however, does not represent the bright limit for precise photometry. Excess charge from saturated pixels is conserved and spread across adjacent pixels in a CCD column until the excess reaches a CCD boundary. This leads to "bleed trails" extending above and below a saturated pixel, similar to what is seen for bright stars in Kepler/K2 photometry. Precision photometry can still be achieved by creating a photometric aperture that is large enough to encompass all excess charge. The TESS bright limit is anticipated to be I_C=4. Because the TESS pixels are large (21 arcsec), the TESS photometry for many targets will be contaminated by nearby objects. One of the goals of the TIC is to provide the information needed to estimate the contamination in the TESS band. This cannot be determined accurately ahead of time because it will depend on the pixels selected for the aperture photometry of each target and the exact position of the target in the aperture. However, it is possible for the TIC to provide some guidance concerning the level of expected contamination, for example by providing the number of known objects and their total brightness in the TESS band for some suitable standard aperture and photometer Pixel Response Function (PRF). 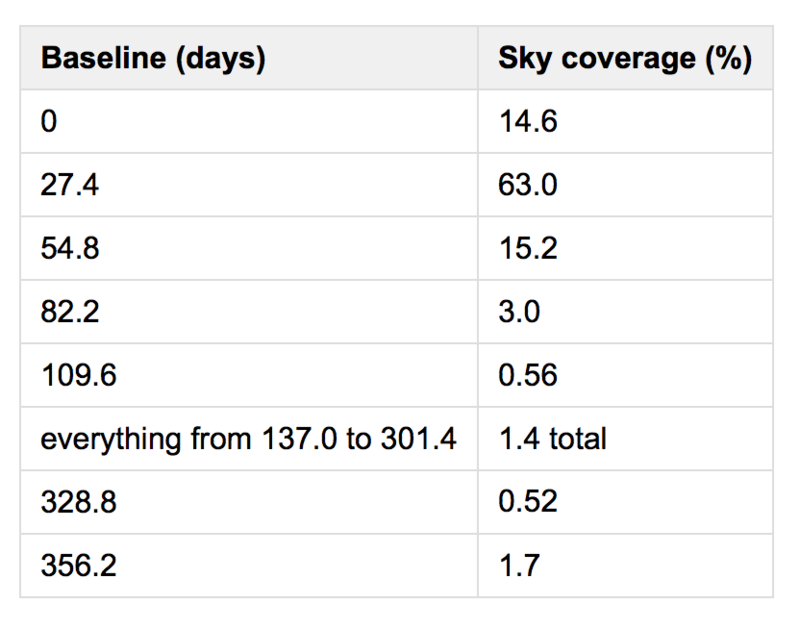 The fraction of sky coverage for different time baselines that TESS will have over the 2-year prime mission is listed below.